The reason these systems are called EASY-FIT is because they come with the pipework, interconnections cables and all materials to perform a standard installation. Also unlike most other Air Conditioning units these do not require vacuuming down - Please note these units still need to be installed by an engineer. The Easy-Fit unit is fitted with three pin plug and/or cable. compatible with normal UK domestic supply. For the electrical connection between the inside and outside units a multi core cable is supplied with easy fit colour coded terminals. • Ensure there is no source of heat or steam nearby. • Ensure there is nothing stopping the installation of the unit before drilling holes. 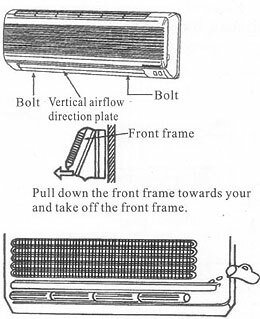 • Follow the measurements from the image on the right to allow good air circulation. • For the unit to work effectively on cooling mode it must be mounted 2m off the ground or above head height. • If you errect a canopy to protect the unit from rain and sun do not obstruct the heating dispersion for the condenser. • Don't keep animals or plants near the outdoor unit as the hot and cold air discharge will cause discomfort. • Make sure to have the distance specified in the picture between ceiling, wall, furniture and other obstacles. 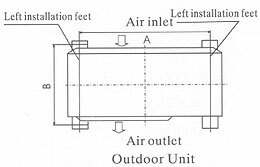 • The outdoor unit must be secure, flat and level. • The outdoor unit must be firmly fixed to avoid falling in strong wind. • Install on a cement base, mounting slab or wall mounting backet as in the drawing. • If the unit is being mounted using wall brackets, the strength of the wall should be assessed to ensure the brackets will hold the unit correctly, anti-vibration feeet should be used to minimise noise transfer into the property from vibration. • Make sure the installation wall is suitably secure. Using four “+” type screws and suitable wall plugs to fasten the installation board onto the wall. Keep it level in horizontal direction and perpendicular in vertical direction. Otherwise it might cause water drips when air-conditioner is running in cooling operation. • Drill 70mm diameter pipe hole at the left lower or right lower side of the installation board. The hole should slant downwards slightly. • Hang the indoor unit to the board and make sure it sits central to the installation plate. • Push the machine towards the wall on the bottom left and bottom right side of the installation board until the unit 'clicks' into place on the installation plate. • As shown in the picture on the right, take off two covers from the front frame and then unfasten two fixture screws. • Pull the front frame towards yourself and take it off. To put the front frame back, reverse the steps. You should check whether the front frame is firmly fixed into the fixture groove on the top. • Pour a cup of water into groove. • Check whether the water flows through the water discharge hole. If your unit does not have an easily removeable front cover or a visible water drain tray, it can be much easier to open up the front cover and remove the filters as would be done for normal weekly maintenance, close the front cover and slowly pour a cup of water through the air inlet at the top of the unit on the left hand side, if the water is poured through on the right hand side there is a chance it will cause damage to the circuit board inside the unit. 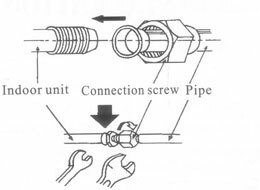 • Connect the pipe to the unit: point to the centre of pipe and fasten the connection screw at first by hand and then by wrench until it is tightly fastened. The fastening direction is shown in the picture. • Do not over tighten. 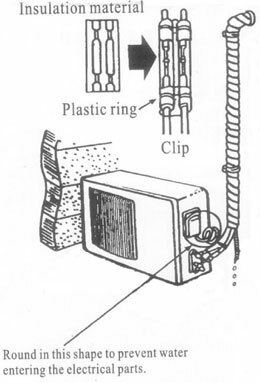 • Wrap up all pipe, water discharge and connection wire from top to bottom using white tape included with system. Going from top to bottom is important as it stops rain water from soaking in through the joins and into the insulation. • Cover the pipe connections with the insulation material and secure with cable ties. 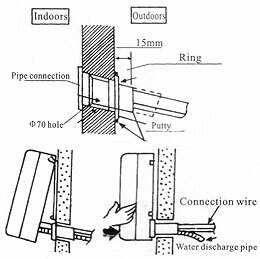 • The pipes need to be secured against a wall using pipe clips or in a length of cable tray using cable ties. This should be done after the pipes, cable and drainage have been bundled together. • Use the putty provided with the systems or expanding foam filler to plug the hole between the inside and outside. 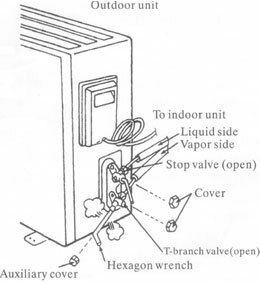 Expelling the air is a necessary step as moist air inside the compressor will cause it to fail. • Remove the brass cap from the top and bottom stop valves. • Take off the auxiliary cover from the T-branch/Schrader valve. • Turn the stop valve (larger valve) anti-clock wise to an angle of 90 degree, keep it open for 8 seconds and close the valve. • Check whether there is air leakage at all connection parts of pipes using leak detection spray or soapy water. • If leaks have been found repeat the last 3 steps and tighten pipes up. 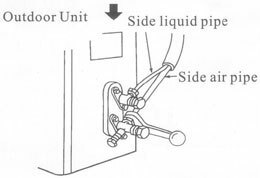 • Open the top and bottom valve with an allen key to make the unit operate. • Once both valves have been opened, the system must be checked thoroughly again for leaks. All connections are colour coded. • Remove the electrical panel cover by removing the screw affixing it in place. • Connect terminals according to colour codes. • Screw up the control panel cover to its original place.